The thing that always surprises me about champagne cocktails is the underlying nefarious nature of many of these drinks. You look at a recipe, think, “oh, it’s just a glass of wine, same stuff you use to toast at weddings and on election night last November — look, there’s only a smidgen of booze in the glass, it’ll be lighter than your run-of-the-mill highball,” then mix up a couple and, boom — your ears are feeling fuzzy. The thing I always forget is that champagne isn’t simply a substitute for seltzer; while it prances and fizzles in the glass, it’s actually getting the gin in that French 75 or the bourbon in that Pendennis all excited to come out of the glass and down your gullet, where the real fun begins. But even though I always underestimate them, each time I start to fiddle with champagne cocktails, I resolve to do it more frequently. This break for bubbly was prompted by Anita and Cameron over at Married…With Dinner, hosts of this month’s Mixology Monday. Champagne cocktails seemed an apt theme, given that it’s tax day (considering that the final calculation of my return reversed a substantial debt and turned it into a small refund, I’m in the mood to celebrate), and that this month marks the first anniversary of Mixology Monday events. Oh, what a year it’s been — from pastis to exotica to whiskey, to a shooter event that fizzled — ah, memories. Okay, I’ll stop — on with this month’s drink. I decided to use this month’s theme to dig into one of the few remaining recipes in Ted Haigh’s Vintage Spirits and Forgotten Cocktails that I have not yet tried: the Crimean Cup a la Marmora. Actually a punch, the Crimean Cup dates back (in print, anyway) to Jerry Thomas’ The Bar-tender’s Guide , from 1862. While several of the old drinks listed by Thomas lack the pizzazz you find in more modern drinks, the Crimean Cup is a happy exception. Mixing rum, brandy, lemon juice, maraschino and orgeat with champagne and soda water, the cup is a surprisingly light and even-handed punch. 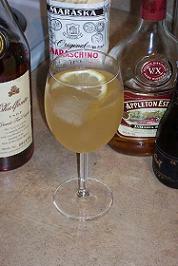 From the recipe, it looks rather sweet, but between the champagne and the soda, the sweetness is easily leavened. If you’re not convinced, simply reduce or eliminate the added sugar, or add a touch more lemon juice. This drink is reason itself to keep a bottle or two of bubbly on hand. Head on over to Anita & Cameron’s place to see what other folks are posting. I tried this one not too long ago and found it delicious, though extremely rich owing to the large amount of orgeat. I kind of felt like doubling or more the lemon juice, and/or adding more bubbles to the drink would have helped. By the end of the drink I was feeling I’d had enough, which is a shame since it’s so good. Paul — thanks so much for asking us to host this edition of MxMo… what fun! And thanks, too, for the under-the-wire entry. Definitely sounds like a winner for when the sun comes out. First of all kudos on your site! It’s great to discover other people who are interested in fine vintage cocktails and the pieces of edible history they represent. Just FYI, a version of the Crimean Cup punch was also included in “The Ideal Bartender” by Tom Bullock, which was first published in 1917. He was a famed bartender at a private club in St. Louis and that catered to the likes of August Busch and Teddy Roosevelt. Bullock was the first African-American to publish a book on bartending; his book was republished a few years ago by Howling at the Moon Press. Bullock also offers a recipe for a Champagne Julep, another that uses Bevo a near-beer invented by Busch in anticipation of Prohibition and some other libations I found interesting.